The global foundation for trusted & scalable data exchange to power the knowledge economy of the future. Throughout history, creating a shift in focus was required to create an edge over the competition. With industrialization, efficiency (doing things right) was important. Soon after, the importance of combining efficiency with effectiveness (doing the right things) grew. After that, speed was the name of the game: while being efficient and effective, you also had to be the first to grasp value on the market. What we are seeing today is yet another jump of a similar scale. It’s no longer about optimizing your organization and processes, it’s about adapting your organization for the optimum of the network (community) within which it operates. This, however, requires new levels of inter-connectivity and integrity among partners in such networks. The OriginTrail protocol was designed to address exactly these challenges, helping networks and communities move from organizational optimums towards supply chain (network) optimums. It is the first protocol that was purposefully built to overcome the problems of information asymmetry and data fragmentation with built-in data integrity and privacy to enable interconnected data at scale. With the launch of the mainnet network at the end of 2018, these features became available and a crucial foundation was created. 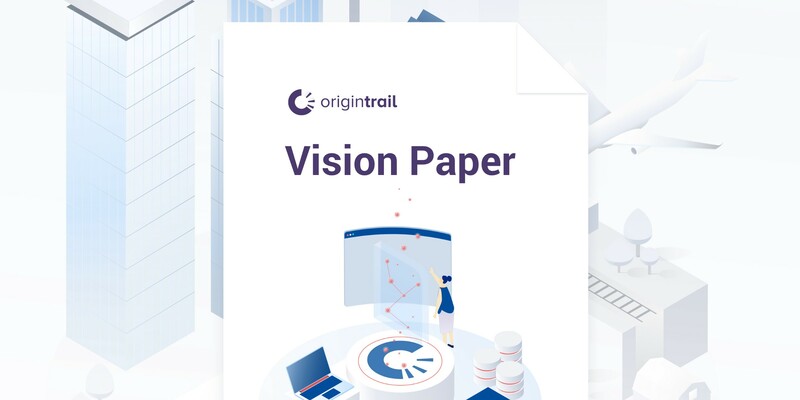 The purpose of this document is to outline key focus areas of the OriginTrail ecosystem, which will open doors for the mass adoption in various business communities of the technological foundations built according to the whitepaper. To be able to power the knowledge economy of the future, we further break down which technical capabilities are now in place and what is on the roadmap for the upcoming two years. After having worked with the most prominent communities, we have addressed hindrances to the adoption of the token-based OriginTrail Decentralised Network (ODN). The blueprint for the adoption mechanism pioneered by the OriginTrail ecosystem is explained here. The technical foundation is only the first stepping stone in unlocking the potential of supporting new ways of business practices. There are other challenges to address as an ecosystem in order to establish OriginTrail as the leading environment for trusted data exchange in future economies. Inclusiveness — Continuing to form partnerships with technological and business global leaders that can employ the OriginTrail ecosystem for their communities. Catering to the needs of leading global communities requires us to be making strides in designing technical infrastructure and business models that support the adoption of the OriginTrail protocol in diverse business communities. Neutrality — Being an open-source, decentralised protocol, based on open global standards, neutrality is crucial for the OriginTrail ecosystem as it prevents vendor lock-ins, ensures integrity, and effectively breaks data silos. Neutrality means adopting co-creation principles and working with other blockchain ecosystems and solutions builders even as they may be competing in the same market on the application level. Usability — Both blockchain environments, as well as the OriginTrail protocol, are fundamental technologies. In order to ensure the onboarding of enterprises, there needs to be a great focus on enhancing user experience, as solutions need to meet the expectations of rapid value generation. Designing mechanisms for companies to employ decentralised solutions and the TRAC token without impeding their existing business processes, and enabling the fast deployment of the OriginTrail protocol without excessively increasing capital expenditures, is crucial. The ambition presented above needs to be placed in the context of the current state of the market when it comes to the use of decentralized ledger technologies (DLT) in the enterprise sector. Last year, many approaches focused on vendor lock-in strategies that hold a distinct risk of producing yet more walled gardens and data silos. We know that companies are excited to trial and explore the value of DLTs. However, our industry feedback suggests they are facing high entry costs and administrative challenges with holding cryptocurrencies. As an industry, we need to move beyond the one-off cases and start to deliver value on an enterprise scale. In 2011, long before the blockchain was referenced for its potential value in supply chains, the OriginTrail founders, Branimir Rakić, Tomaž Levak, and Žiga Drev, designed the first data exchange and aggregation system, helping some 100 organic beef producers to effectively differentiate from their competition based on transparency. This first version of the system was the foundation for what, in 2013, became known as the OriginTrail solution. Having worked on perfecting OriginTrail for years — which, back then, indeed offered an unprecedented level of transparency in supply chains of manufacturers using it — we figured out all centralised IT solutions for data exchanges lacked the fundamentals for businesses and individuals to be able to trust each other. The blockchain, however nascent technology it was (and arguably still is), seemed to be a good fit for challenges we witnessed at that point. Nevertheless, using the blockchain existing solution back then — early pilots were completed in late 2016 — produced mixed results. Scalability issues, cost considerations, and lack of privacy layers, soon proved insurmountable obstacles to overcome using solely the existing blockchain networks. Stemming from hands-on experience using the blockchain in supply chains, the OriginTrail protocol concept was born in 2017 and repositioned as an open source technology. Complementing existing decentralised solutions, the core protocol features are data scalability and interconnectivity, with built-in interoperability with different legacy systems. What used to be a centralised, proprietary, OriginTrail solution bringing transparency and integrity to supply chains, became a non-proprietary, royalty-free, and open source project that has gained traction, so far. The OriginTrail Vostok Mainnet, which was launched in December 2018, thus became a ready-to-use network for different user communities. OriginTrail has historically been focusing on the adoption of transparency-enabling solutions. The team had, until recently, been focused on heavily on food supply chain challenges consequently creating the largest impact in that sector. The food supply communities have therefore become the first to adopt OriginTrail Decentralised Network. From agriculture, food manufacturing, and certification of food, the speed of adoption is now less dependant on the maturity of the technology and is more a function of efficient management and processes. To continue improving on the operational efficiency of serving user communities, the core technology builder organisation for OriginTrail was repositioned and renamed Trace Labs. We will continue improving the technology and distribution channels, and embedding OriginTrail in products best solving the client needs. Apart from continuing to develop the open source OriginTrail protocol, Trace Labs is launching the Network Operating System (nOS), powered by OriginTrail, along with an initial bundle of applications needed to onboard user communities on the OriginTrail Decentralised Network. nOS, as a traditional operating system, abstracts lower-layer technical complexities and allows for quicker development, implementation, and a seamless user experience. Having launched nOS, the friction to use decentralised networks has considerably decreased. With nOS, the time of deployment of OriginTrail company nodes is shortened from several days to a couple of minutes. Assisting solution providers and enterprise users with supply chain mapping, correct data structures and various blockchain integrations, nOS decreases implementation time and deployment costs of entire solutions by up to 10 times. nOS has already been listed on the Oracle Cloud Marketplace and is giving all Oracle Cloud users access to its functionalities. OriginTrail is an ecosystem created around an open source, decentralised OriginTrail protocol. It’s based on a token economy with direct relations between users and network nodes, free of arbitrary fees. A partnership consortium and knowledge hub, which intends to continue bringing together various organisations showing interest in the OriginTrail ecosystem. Its main goals are to enable sharing educational content, foster collaborations on use cases, and encourage experience sharing amongst members. It is currently 85 members strong. The core development company for the OriginTrail ecosystem is being renamed and repositioned as Trace Labs. 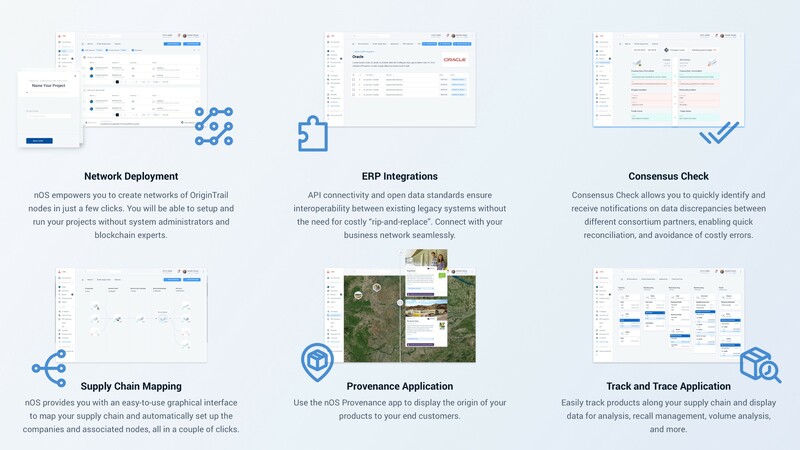 In addition to developing open source technology for the ODN, Trace Labs also focuses on bringing application-level software built on top of the fundamentals of the OriginTrail protocol, to lower time to deployment and catalyse adoption of OriginTrail technologies. Finally, the ability to tokenize and get compensated for the data provided on request, enabling the ecosystem to evolve its data marketplace. The anatomy of the network, with the TRAC token as the fuel, allows for further derivation of utilities as the ecosystem evolves, without limits or requirements imposed by any party in the system. Because of the limited supply (TRAC is a non-inflationary token) the economics behind the system are predictable and designed in such a manner that the utilization of the TRAC is in direct correspondence with the utilization of the underlying technology of ODN, therefore being open to encompass any additional technological utility that may arise from ecosystem developments. When the TRAC token economics and all of the above utilities are put into practice, they create a triple effect. When data gets published on ODN, the publisher creates a certain demand for TRAC that is used to compensate the nodes in the network for holding the published data. At the same time, the same demand gets created for TRAC that is put as collateral for that particular job. While that collateral gets locked, it effectively also lowers the entire available supply of TRAC, thus creating the third effect. The administrative handling of cryptocurrencies on the books of companies varies in different jurisdictions and provides a certain friction in technology adoption. It is, therefore, very important to create ways of addressing these complexities to ensure long-term adoption. The OriginTrail ecosystem has lately seen the addition of Bittrex exchange as one of the exchanges to support TRAC. We are also glad to unveil that Trace Labs will be integrating Bittrex in the nOS product to handle obtaining TRAC for clients using the nOS. Instead of having to deal with exchanges directly, companies will now be able to utilise the nOS service to obtain TRAC and use it immediately in the ODN without holding crypto-currencies on their books. Similarly, solution providers are also able to use the same service for their applications and even make an integration with the exchanges directly. As core developers of OriginTrail, our team is focusing heavily on continuing research and development of the OriginTrail protocol components, as well as necessary tools to enable additional utilization and more efficient usage of the technology, most notably the lower application layer enablers on the Network Operating System. All the technical activities are aligned together with learnings and efforts in the development of business communities. These efforts and milestones in the development of the ecosystem are outlined in the updated roadmap. Bittrex listing and Trace Labs mechanism for corporate access to Trace token established. Additional OriginTrail development frameworks open sourced. Government and public agencies solutions released. Set of cloud application development tools.